Internationally acclaimed Tour Guide Justin Ferate has earned a reputation for his informative, exciting, and entertaining New York City Walking Tours, Limousine Tours, and Bus Tours. 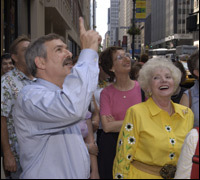 As a noted Guide and Lecturer for over 25 years, Mr. Ferate was hired by the City of New York to create the official NYC Tour Guide Licensing Examination. Through his stimulating and knowledgeable commentary Justin reveals hidden and lesser-known sides of the New York City we know and love. Discover quirky aspects of New York that surprise and delight even "dyed-in-the-wool" New Yorkers. You can hire Justin to conduct a private Motorcoach Tour, Walking Tour, or Slide Presentation for your group. Corporate clients, corporate guests, organizations and even family functions have all enjoyed Justin's keen insight and entertaining commentary. For some tour ideas visit our Custom Private Tours page. 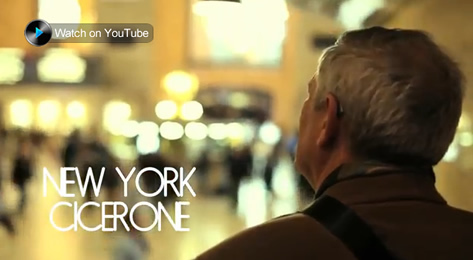 Justin Ferate’s regularly scheduled New York City Walking Tours are also very popular. With an emphasis on lesser-known and often surprising aspects of New York City, these publicly available tours will delight both New Yorkers and visitors alike. Visit the Tour Schedule for more information about upcoming tours. Featured in the bookstore are Justin's hand-picked book recommendations in all topics New York. From general Visitors' Guides, Visitor Maps, and classic New York novels to important texts that all students of New York and Tour Guides should not be without. If your interest is New York, these are the books for you! For over 25 years, Justin has guided groups through the city. His tours of New York City have been seen and heard on national and international television and radio programs. 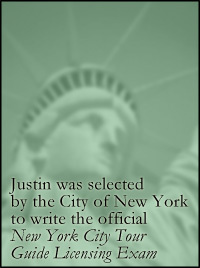 In 2003, Justin was selected by the New York City Department of Consumer Affairs to create the official NYC Professional Tour Guide Licensing Exam. Justin and host Ronnie Eldridge of Eldridge & Co. on CUNY TV talk about places well-known to many of us and about some of New York's more obscure but most wonderful sites. Have you visited the 911 Memorial on Staten Island? Watch Justin's full episode on YouTube or at cuny.tv. Justin Ferate was featured in the November 2007 Essential Secrets issue as one of 50 essential secrets of New York City. In this issue the Time Out New York editors chose "the city's most vital places, people and things". Justin Ferate was listed along with other noteables such as The Guggenheim museum, Carnegie Hall and The Hayden Planetarium at the American Museum of Natural History where it is explained, "This venerated historian wrote the book on Gotham walking tours..."
Listen to news report and a portion of Justin's tour!